These 79 questions from the DVSA revision question bank cover what to do when you are responding to accidents whether you are involved or an observer. Remember this procedure by saying DR ABC. This stands for Danger, Response, Airway, Breathing, Circulation. Give whatever first aid you can and stay with the injured person until the emergency services arrive. After a casualty has been placed in the recovery position, make sure their airway remains open and monitor their condition until medical help arrives. Where possible, don't move a casualty unless there’s further danger. An adult casualty isn't breathing normally. To maintain circulation, place two hands on the centre of the chest. Then press down hard and fast – around 5–6 centimetres and about twice a second. When the area is safe and there’s no danger from other traffic or fire it’s better not to move casualties. Moving them may cause further injury. Your priority is to cool the burns with clean, cool water. Its coolness will help take the heat out of the burns and relieve the pain. Keep the wound doused for at least 10 minutes. If blisters appear, don’t attempt to burst them, as this could lead to infection. A minor incident in a tunnel can quickly turn into a major disaster. Variable message signs are provided to warn of any incidents or congestion. Follow their advice. A tyre bursting can lead to a loss of control, especially if you’re travelling at high speed. Using the correct procedure should help you to stop the vehicle safely. Pull onto the hard shoulder and use the emergency telephone to report your problem. This lets the emergency services know your exact location so they can send help. Never cross the carriageway to use the telephone on the other side. Lorry drivers can be unaware of objects falling from their vehicles. If you see something fall onto a motorway look to see if the driver pulls over. If they don’t stop, do not attempt to retrieve it yourself. Pull on to the hard shoulder near an emergency telephone and report the hazard. You will be connected to the police or a Highways Agency control centre. If a disabled driver’s vehicle breaks down and they are unable to walk to an emergency phone, they are advised to stay in their car and switch on the hazard warning lights. They may also display a 'Help’ pennant in their vehicle. If the vehicle in front is on fire, you should pull over to the side and stop. Switch on your warning lights and switch off your engine. If you can locate a fire extinguisher use it to put out the fire, taking great care. Do NOT open the bonnet. Always call for help from the nearest emergency point and if possible give first aid to anyone who is injured. Check the casualty for shock and, if possible, try to cool the burn for at least 10 minutes using clean, cool water. Once the airway is open, check breathing. Listen and feel for breath. Do this by placing your cheek over their mouth and nose, and look to see if the chest rises. This should be done for up to 10 seconds. Talk to the casualty and keep them calm. Do not attempt to move them as this could cause further injury. Call an ambulance at the first opportunity. Try to stay calm, especially if you have passengers on board. If you can’t restart your engine before the warning bells ring, leave the vehicle and get yourself and any passengers well clear of the crossing. This is the minimum distance to place the triangle from the obstruction. If there’s a bend or hump in the road place it so that approaching traffic has plenty of time to react to the warning and slow down. You may also need to use your hazard warning lights, especially in poor visibility or at night. Try not to react by applying the brakes harshly. This could lead to further loss of steering control. Indicate your intention to pull up at the side of the road and roll to a stop. If a casualty is bleeding heavily, raise the limb to a higher position. This will help to reduce the blood flow. Before raising the limb you should make sure that it is not broken. If you suspect a fire in the engine compartment you should pull up as safely and as quickly as possible. DO NOT open the bonnet as this will fuel the fire further. Get any passengers out of the vehicle and dial 999 immediately to contact the fire brigade. If your vehicle breaks down on a level crossing, your first priority is to get everyone out of the vehicle and clear of the crossing. Then use the railway telephone, if there is one, to tell the signal operator. If you have time before the train arrives, move the vehicle clear of the crossing, but only do this if alarm signals are not on. There are a number of things you can do to help, even without expert training. Be aware of further danger from other traffic and fire; make sure the area is safe. People may be in shock. Don’t give them anything to eat or drink. Keep them warm and comfortable and reassure them. Don’t move injured people unless there is a risk of further danger. Various items can provide invaluable help in the event of a collision or breakdown - such as a first aid kit and a fire extinguisher. They could even save a life. Take notice of any instructions given on variable message signs or by tunnel officials. 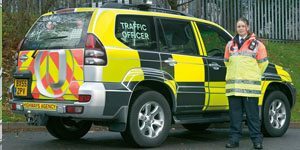 They will warn you of any incidents or congestion ahead and advise you what to do. A casualty suffering from shock may have injuries that aren't immediately obvious. Call the emergency services then stay with the person in shock, offering reassurance until the experts arrive. If you need to display a warning triangle make sure that it can be clearly seen by other road users. Place it on the same side of the road as the broken down vehicle and away from any obstruction that would make it hard to see. It’s important that people at the scene of a collision do not create further risk to themselves or others. If the incident is on a motorway or major road, traffic will be approaching at speed. Do not put yourself at risk when trying to help casualties or warning other road users. If the property owner is not available at the time, you MUST inform the police of the incident. This should be done as soon as possible, and within 24 hours. The DR ABC code has been devised by medical experts to give the best outcome until the emergency services arrive and take care of casualties. If you are involved in a collision in a tunnel be aware of the danger this can cause to other traffic. The greatest danger is fire. Put on your hazard warning lights straight away and switch off your engine. Then call for help from an emergency telephone point. • smoke when refuelling your vehicle. If you are wearing sunglasses you should remove them before driving into a tunnel. If you don’t, your vision will be restricted, even in tunnels that appear to be well-lit. It’s important to keep a safe distance from the vehicle in front at all times. This still applies in congested tunnels even if you are moving very slowly or have stopped. If the vehicle in front breaks down you may need room to manoeuvre past it. Make sure you know what the different warning lights mean. An illuminated warning light could mean that your car is unsafe to drive. Don’t take risks. If you aren’t sure about the problem get a qualified mechanic to check it. Have the correct details ready before you use the emergency telephone. The operator will need to know the details of your vehicle and its fault. For your own safety always face the traffic when you speak on a roadside telephone. Try to keep calm and don’t rush. Make sure that you've shared all the relevant details with the other driver before you leave the scene. If possible take pictures and note the positions of all the vehicles involved. Do not move a casualty unless there is further danger, for example, from other traffic or fire. They may have unseen or internal injuries. Moving them unnecessarily could cause further injury. Do NOT remove a motorcyclists helmet unless it’s essential. If there’s nothing in the wound, applying firm pressure using a pad of clean cloth or bandage will help stem the bleeding. Don’t tie anything tightly round the leg, as this will restrict circulation and could result in long-term injury. At a crash scene you can help in practical ways, even if you aren’t trained in first aid. Call the emergency services and make sure you don't put yourself or anyone else in danger. The safest way to warn other traffic is by switching on your hazard warning lights. It’s usually better to drive a burning vehicle out of a tunnel. If you can’t do this pull over and stop at an emergency point if possible. Switch off the engine, use hazard warning lights, and leave the vehicle immediately. Call for help from the nearest emergency point. If you have an extinguisher it may help to put out a small fire but don't try to tackle a large one. Firstly get yourself and anyone else well away from the crossing. If there’s a railway phone use that to get instructions from the signal operator. Then if there’s time move the vehicle clear of the crossing. Sometimes you may not realise that someone is in shock. The signs to look for are rapid pulse, sweating, pale grey skin and rapid shallow breathing. DO NOT remove a motorcyclist’s helmet unless it is essential. Remember they may be suffering from shock. Don’t give them anything to eat or drink but do reassure them confidently. The motorcyclist is in an extremely vulnerable position, exposed to further danger from traffic. Approaching vehicles need advance warning in order to slow down and safely take avoiding action or stop. Don’t put yourself or anyone else at risk. Use the hazard warning lights on your vehicle to alert other road users to the danger. It’s important to ensure that the airway is open before you start CPR. To open the casualty’s airway, place your fingers under their chin and lift it forward. Remember DR ABC (Danger, Response, Airway, Breathing, Compressions). An unconscious casualty may have difficulty breathing. Check that their airway is clear by tilting the head back gently. Unblock the airway if necessary, then make sure the casualty is breathing. Compressions may need to be given to maintain circulation. Further collisions and fire are the main dangers immediately after a crash. If possible get others to assist you and make the area safe. Help those involved and remember DR ABC, (Danger, Response, Airway, Breathing, Compressions). This will help when dealing with any injuries. If you are in a collision that causes damage or injury to any other person, vehicle, animal or property, by law you MUST STOP. Give your name, the vehicle owner’s name and address, and the vehicle’s registration number to anyone who has reasonable grounds for requiring them. It is important to make sure that emergency services arrive on the scene as soon as possible. When a person is unconscious, they could have serious injuries that are not immediately obvious. Advance warning triangles fold flat and don’t take up much room. Use it to warn other road users if your vehicle has broken down or there’s been an incident. Place it at least 45 metres (147 feet) behind your vehicle or incident on the same side of the road or verge. Place it further back if the scene is hidden by, for example, a bend, hill or dip in the road. Don’t use them on motorways. It’s important to cool a burn for at least ten minutes. Use a clean, cold non-toxic liquid preferably water. Bear in mind the person may also be in shock. Before entering a tunnel you should switch on your dipped headlights, as this will allow you to see and be seen. In many tunnels it is a legal requirement. Don’t wear sunglasses while driving in a tunnel. You may wish to tune your radio into a local channel. If possible, lay the casualty down. Protect yourself from exposure to blood and, when you're sure there's nothing in the wound, apply firm pressure to it using clean material. If someone has been injured, the sooner proper medical attention is given the better. Send someone to phone for help or go yourself. An injured person should only be moved if they’re in further danger. An injured motorcyclist’s helmet should NOT be removed unless it is essential. If a casualty is unconscious, you need to check that they're breathing normally. Look for chest movements, look and listen for breathing, and feel for breath on your cheek. At the scene of an incident always be aware of danger from further collisions or fire. The first priority when dealing with an unconscious person is to ensure they can breathe. This may involve clearing their airway if you can see an obstruction, or if they’re having difficulty breathing. If a young child has stopped breathing, first check that their airway is open and then begin CPR. With a young child, you may only need to use one hand and you shouldn’t press down as far as you would with an adult. Continue the procedure until the child is breathing again or until a medical professional takes over. The effects of shock may not be immediately obvious. Warning signs are rapid pulse, sweating, pale grey skin and rapid shallow breathing. If a casualty isn't breathing normally, cardiopulmonary resuscitation (CPR) may be needed to maintain circulation. Place two hands on the centre of the chest and press down hard and fast – around 5–6 centimetres and about twice a second. The most immediate danger is further collisions and fire. You could warn other traffic by displaying an advance warning triangle or sign (but not on a motorway), switching on hazard warning lights or by any other means that does not put you or others at risk. You MUST stop if you've been involved in a collision which results in injury or damage. The police may ask to see your driving licence and insurance details at the time or later at a police station. Make sure that the emergency services are called immediately. Remember DR ABC (Danger, Response, Airway, Breathing, Compressions) and, once first aid has been given, stay with the casualty. On the approach to tunnels a sign will usually show a local radio channel. It should give a warning of any incidents or congestion in the tunnel ahead. Many radios can be set to automatically pick up traffic announcements and local frequencies. If you have to tune the radio manually don’t be distracted while doing so. Incidents in tunnels can lead to serious casualties. The greatest hazard is fire. Getting an advance warning of problems could save your life and others. There will be an orange label on the side and rear of the tanker. Look at this carefully and report what it says when you phone the emergency services. Details of hazard warning plates are given in The Highway Code. Briefly using your hazard warning lights will warn the traffic travelling behind you that there's a hazard ahead. This can reduce the chance of vehicles crashing into the back of each other. If your vehicle breaks down in a tunnel it could present a danger to other traffic. First switch on your hazard warning lights and then call for help from an emergency telephone point. Don’t rely on being found by the police or being seen by a CCTV camera. The longer the vehicle stays in an exposed position, the more danger it poses to other drivers. Follow the instructions given by the signs or by tunnel officials. In congested tunnels a minor incident can soon turn into a major one with serious or even fatal results. When someone is injured, any movement which is not absolutely necessary should be avoided since it could make injuries worse. Unless it is essential, it’s generally safer to leave a motorcyclist’s helmet in place. If any object falls onto the motorway carriageway from your vehicle pull over onto the hard shoulder near an emergency telephone and phone for assistance. You will be connected to the police or a Highways Agency control centre. Don’t stop on the carriageway or attempt to retrieve anything. Keeping casualties or witnesses calm is important, but never offer a cigarette because of the risk of fire. Bear in mind they may be in shock. Don’t offer an injured person anything to eat or drink. They may have internal injuries or need surgery. If it’s possible, and you can do so without causing further danger, it may be safer to drive a vehicle which is on fire out of a tunnel. The greatest danger in a tunnel fire is smoke and suffocation. The first priority with a casualty is to make sure their airway is clear and they’re breathing. Any wounds should be checked for objects and bleeding stemmed using clean material. Ensure the emergency services are called as they’re the experts. If you’re not first aid trained consider getting training. It might save a life. A broken-down vehicle in a tunnel can cause serious congestion and danger to other road users. If your vehicle breaks down, get help without delay. Switch on your hazard warning lights, then go to an emergency telephone point to call for help. At the scene of an incident, always be aware of danger from further collisions or fire. The first priority when dealing with an unconscious person is to ensure they're breathing normally. If they’re having difficulty breathing, follow the DR ABC code. If you’re the first to arrive at a crash scene the first concerns are the risk of further collision and fire. Ensuring that vehicle engines are switched off will reduce the risk of fire. Use hazard warning lights so that other traffic knows there’s a need for caution. Make sure the emergency services are contacted, don’t assume this has already been done. • following drivers on a motorway of a hazard or obstruction ahead. They should not be used as an excuse for dangerous or illegal parking. Pull up on the hard shoulder and make your way to the nearest emergency telephone to call for assistance. Do not attempt to repair your vehicle while it is on the hard shoulder because of the risk posed by traffic passing at high speeds.